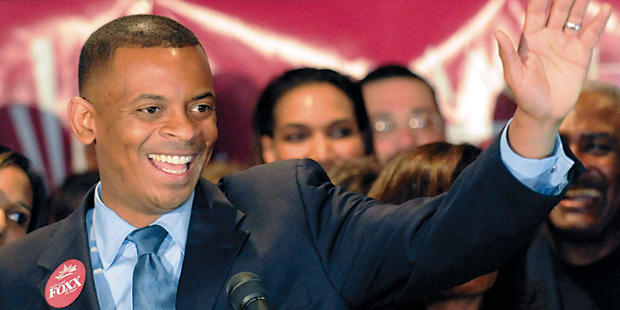 Anthony Foxx ’96, Charlotte’s charismatic new mayor, has been preparing for this job all his life. Anthony Foxx ’96 was weaned on politics. From an early age, he helped make election signs after school. Politics permeated the family dinner discussions, and aspiring politicians called at the house in search of advice from his maternal grandfather, an elder statesman of Charlotte, NC, politics. Foxx and his mother, Laura—a single college student when her son was born—lived with her parents: Mary, now 93 and a retired French teacher, and the late James Foxx Sr., a former educator who was a behind-the-scenes political strategist and tireless party worker. “Anthony grew up at his feet,” says Harvey Gantt, a family friend and former Charlotte mayor. At Davidson College, Foxx, one of just 68 black students, was elected student council president. “He connected with the students. They respected him and felt that he could look out for a broad range of people,” explains Ferguson’s son Jay, who co-wrote a college newspaper column with Foxx. Foxx went on to work in every branch of the federal government. He served as a law clerk for Judge Nathaniel Jones of the U.S. Court of Appeals for the Sixth Circuit, a trial attorney for the Civil Rights Division of the Justice Department during the Clinton administration, and a staff counsel to the House Judiciary Committee. There, he met his wife, Samara, an attorney. He wooed her with the one song he knew how to play on the trumpet. “He was not a bit musical. But if he gets an idea that he thinks is a good one, he’ll take a chance,” says the elder Ferguson, explaining how Foxx traveled to New Orleans to learn the instrument. The couple now has two children: Hillary, 6, and Zachary, 4.